With the UK government committing to drastically reduce the nation's carbon emissions by 2050, there is an unprecedented drive to cut energy use in all buildings, public or private. 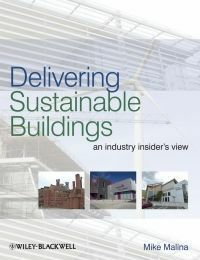 Written by a leading practitioner in the field, this book brings together in one volume a complete overview of the main issues involved in the design, planning, construction, and maintenance of energy-efficient and sustainable buildings. With plenty of practical advice and tips on pitfalls to avoid, this book delivers essential guidance for designers, project managers, contractors, and installers working on sustainable projects. Mike Malina is founder and Director of Energy Solutions Associates - a Building Services Engineering Practice in the field of Sustainable Engineering, Energy Management and Training. He has 30 years' related experience working at the start of his career in the offshore oil industry, then working in both the public and private sectors in related buildings and building engineering services sector. He is the principal trainer for the Building & Engineering Services Association (formally HVCA), Building Regulations Competent Persons Certification scheme for commercial and domestic HVACR work. Over many years Mike has conducted hundreds of building energy audits and has never been defeated in finding ways to save energy. In 2010 he won the HVR Consultant of the year award and in 2011 the Innovation and Sustainability outstanding contribution to the Industry award. Mike has spoken at many industry conferences and seminars, building a reputation for saying it as it is and cutting through all the 'greenwash'.